We are not without sympathy for the Muslim Egyptian who is under pressure, indeed coercion towards a Sharia fundamentalism that’s touted today in Egypt – in particular by the powers-that-be from Al-Azhar Institute, the Muslim Brotherhood factions and the fundamentalist Salafi remnant currently influencing believers. It is difficult to be patient with the slow process of expunging or relegating these influences and the long-haul of reform (if in fact the effort to do so actually exists in Egypt today as we are told) when the outcome of Sharia brainwashing is so gruesomely apparent in crimes such as last Thursday’s bludgeoning to death of Coptic Christian Orthodox Monsignor Samaan Shehata. In an indisputable act of jihad by a Cairo Muslim named Ahmed Saayed Al Sunbaty wielding a sword in the streets of Al Marg in Egypt’s capital city, two Orthodox priests, Father Beeman Muftah and Monsignor Samaan, became the targets of this jihadist. On Thursday, October 12, the two priests were visiting Cairo to raise funds for the poor villagers of Bani Sweef (Al Minya). They departed from a store (a construction steel seller) and returned to their car where the Monsignor realized he forgot his cell phone in the store. Father Beeman asked their driver, Gerges Kamel, to accompany the Monsignor on his return to the store in order to retrieve it. There was water in the street dividing us. I followed him separated by water, and suddenly I saw a man carrying a sword begin to follow Monsignor Samaan who began running toward the store. At the store entrance, the attacker reached the Monsignor and stabbed him in his side. Monsignor fell to the ground. At that point, the killer stabbed him again in the neck, slaughtering him. The murderer then hit him in the skull and then carved a cross with the same tool into Monsignor Samaan’s forehead. The driver continued to say that the street was filled with pedestrians who were present at the scene, but no one intervened. The jihadist ran off but not before tossing onto the Monsignor’s body a handwritten note from his pocket. It all happened in four minutes. Ahmed Saayed Al Sunbaty was apprehended by citizens with the police who by then were a few meters away from the carnage. The Monsignor remained alive for another half hour waiting for an ambulance to navigate Cairo’s streets. It arrived one hour after he died. Some say dispatchers work slowly when an emergency call comes in for Christians. Mr. Kamel estimated that the Monsignor’s life could have been saved. Al Sunbaty’s neighbors told reporters that he lives in the area where he murdered the Monsignor and is well-known for his devotion to Islamic jihad, often directing insults to Christians. In general, Copts rekindled the ire of jihadists when they became one of the forces favoring removal of the former Muslim Brotherhood ruler, President Morsi. Copts were labeled as enemies for their political views after June 30, 2012 and hostility toward Copts proliferated throughout radio and television broadcasts until today. Reaction to the incident has brought only silence as of yet from Islam’s highest governing authority with its Sunni Muslim Institute located in Cairo. The Institution of Islamic scholars is obstinate when it comes to the slightest reforms and least of all to jihad, one of the major pillars of Islam. As of this writing, no statement has come from President Al-Sisi who normally garners praise from Copts. 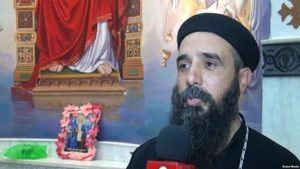 Coptic Bishop Rafael addressed government authorities in a statement making mention of the increase of frequency of jihad since churches began to burn in 1972, the very year Monsignor Samaan was born, adding that it demonstrates how poorly the state is handling religious crimes and the extremism of a culture which needs to change by a huge effort yet to begin. Defective security monitoring, prosecution of victims instead of the perpetrators, releasing the guilty without penalty when arrested; all foster the system of religious jihad, stressed the Bishop. Agreement came from Germany, where Pope Tawadros II resides temporarily for therapeutic reasons, in his statement expressing the Monsignor’s final reward for a purposeful life and death: “celebrating with heaven, receiving another martyr to paradise of joy…he joined the procession of victory like his predecessors of the Church…” Indeed. Voice of the Copts offers condolences to all who knew and loved the Monsignor. Our prayers and sympathies go to Monsignor Samaan’s family and congregation. We hope and pray as well that President Al-Sisi is enabled and directed by the Almighty to work toward equality throughout Egypt’s system of justice, end anti-Coptic rhetoric, and begin genuine reform within Islam despite the very discouraging signs we see — all as a foundation to build a better future for Egyptians.